I’ve been along to the Open Eye gallery to see the small exhibition of landscapes by E Chambre Hardman that’s currently showing there. Open Eye is the appropriate place for a display of Chambre Hardman’s work – after all,without the intervention of Peter Hagerty, Open Eye’s Director at the time, Hardman’s entire photographic output would have been lost. What a revelation awaited me, his home and studio were filled with early twentieth century photography, an entire collection of photographic prints, negatives, cameras, lights, darkroom equipment, letters and studio records. 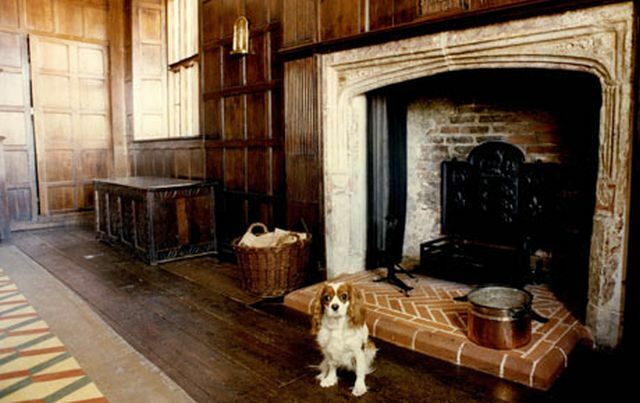 Although much neglected, a number of ceilings had collapsed in the intervening years, every room was crammed with photographs and ephemera and complemented by the more domestic scenes in the two rooms and small kitchen where Hardman and Margaret had lived. It was clear to Hagerty that Hardman’s work must be protected, and since Chambré had no living relatives to assist, friends and supporters came together to form the E.Chambré Hardman Trust. 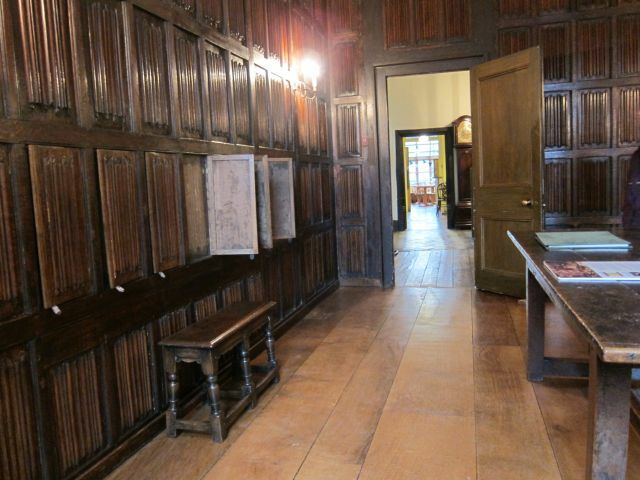 During the following years the trustees worked to secure funding and support from English Heritage and Liverpool City Council which allowed essential repairs and a conservation programme to begin, but it was not until 2003 when the National Trust took over the administration of the house and opened it to the public that Hardman’s legacy was secure. More than twelve thousand of Hardman’s photographs have been catalogued as a result of the Trust’s work, and in the last 30 years the scale of his artistic achievement has gradually emerged. It was at Open Eye that the first retrospective exhibition of Hardman’s work was shown in 1980, followed by a major exhibition E. Chambré Hardman Photographs 1921-72 organised by the Walker Art Gallery in 1994. Chambré Hardman, who was born in 1898 and died in 1988, is still perhaps best known for his photograph The Birth of the Ark Royal (1950). For half a century from 1923 he and his wife Margaret ran a highly successful commercial portrait studio, first on Liverpool’s Bold Street and, from 1949, on Rodney Street in the premises now owned by the National Trust. While the studio specialised in portraits, increasingly Hardman turned to photographing Liverpool’s great buildings, as well as scenes of shipping and the Mersey docks. 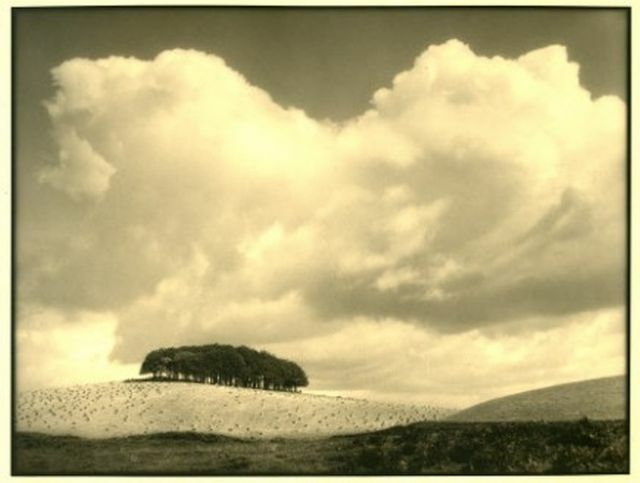 From the early 1930s Hardman began to develop his passion for picturing the varied British landscape, and some of these images are now displayed at Open Eye. Taken together, these photos might be taken as an evocation of a lost era of hay ricks, country lanes and open countryside. 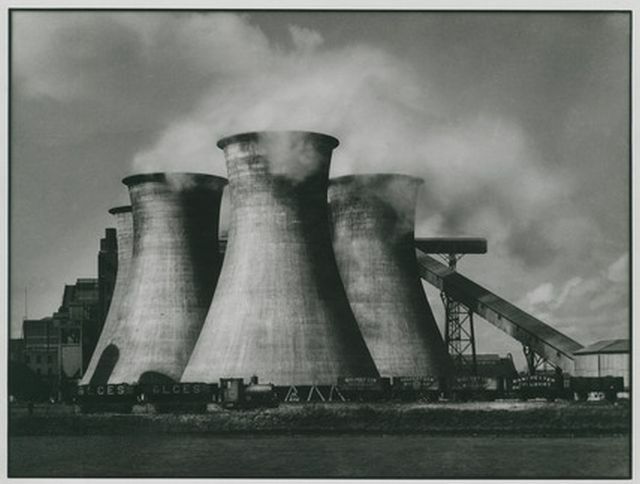 But Hardman wasn’t exclusively drawn to pastoral subjects: the first image that greets you in this exhibition is ‘Power Station Lister Drive’, taken in 1929. In its own way, this is as much an image of a lost world as ‘The Rick’: an era of coal and of giant power stations in the heart of urban residential communities. 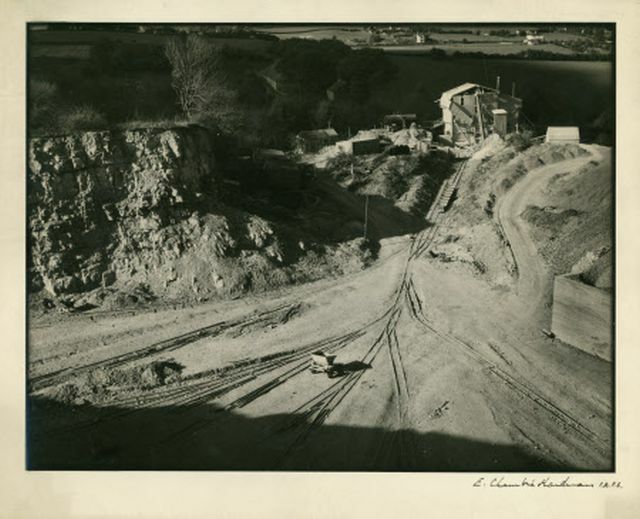 ‘The Quarry, Wales’ from 1937, also depicts an industrial landscape, but at the same time is a study in light and shade and patterns. The tracks of wagon ways splay out towards the viewer like crow’s feet. ‘Suilven, Sutherland’ (1935) is a complete contrast, an image of a bleak and empty landscape taken in Suilven, south of Lochinver and Loch Assynt. Another study in light and dark, it contrasts the shaft of light falling on a remote mountain tarn with the dark of the mountains brooding beyond. Like several photos in the exhibition, it is also a study of the cloud formation which fills the sky and half the frame. 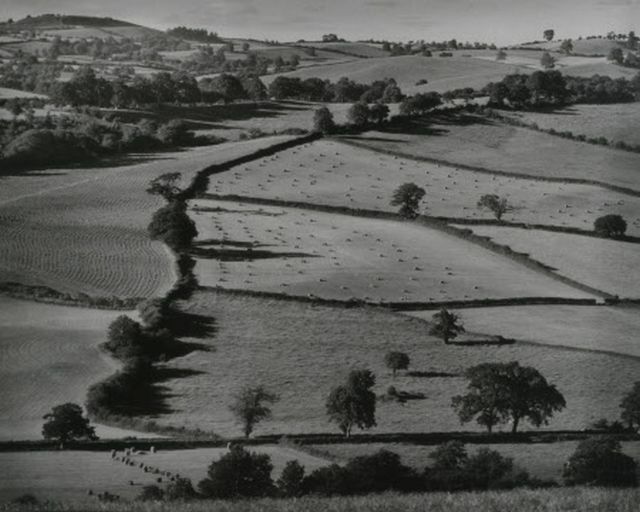 Another rural image, taken much later in his career, is ‘Hill Farming Country’, from 1965. 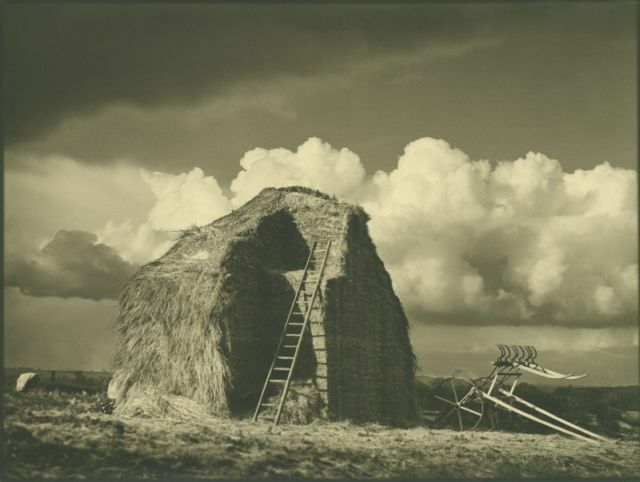 The photograph was taken in Wales, and looks as if it could have been captured in the 1920s or 30s, with its scene of fields full of corn stooks. What I really like about this image is the way that Hardman has captured the evening light, with the trees that border the fields casting long shadows across fields etched into the landscape by the hedges that border them. 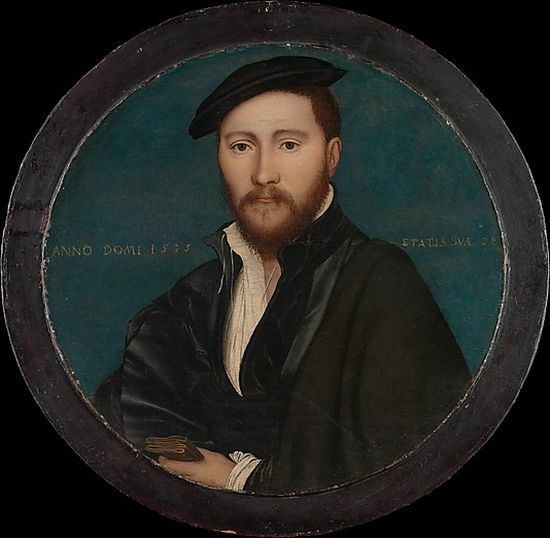 The Hardmans made their living primarily from portrait photography. But, while landscapes were less financially rewarding than portraits, landscape photography dominated competitive exhibitions and professional galleries. From the 1920s onwards Hardman was a frequent exhibitor at annual exhibitions, including the Royal Photographic Society, and in 1927 won first prize in the American Annual of Photography Exhibition for his picture of the quiet French fishing village Martigues. This was one of the many photographs Hardman made in France during 1926 that included the popular ‘A Memory of Avignon’ which depicted in soft focus the sleepy ambience of a street cafe where his friends are relaxing after lunch. My favourite photograph in this exhibition is ‘The Copse’ (1934) which shows a small copse on a hill surrounded by sweeping fields. 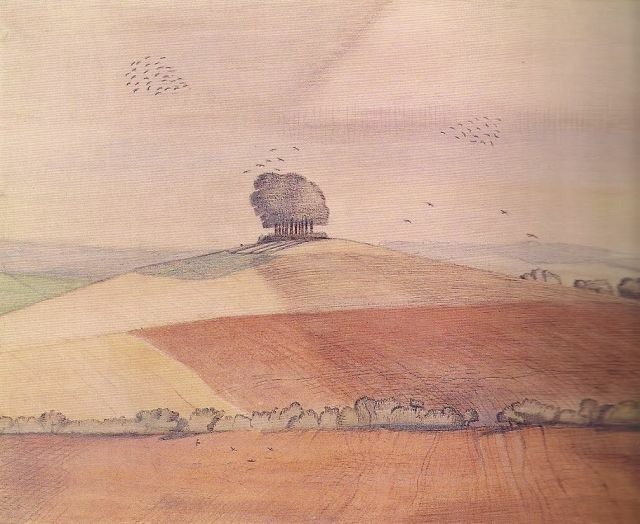 I thought it might be somewhere like Wittenham Clumps in Oxfordshire, painted repeatedly by Paul Nash. Surprisingly, however, this is a scene from Galloway, in Scotland. The image is another cloud study: the towering clouds dominate the upper two thirds of the composition. During the 1930s, Chambre and Margaret would take time off running their busy portrait studio and spend weekends and holidays exploring the British countryside. Using trains and bicycle they appear to have travelled the length and breadth of Britain in their search for new landscape photographs. 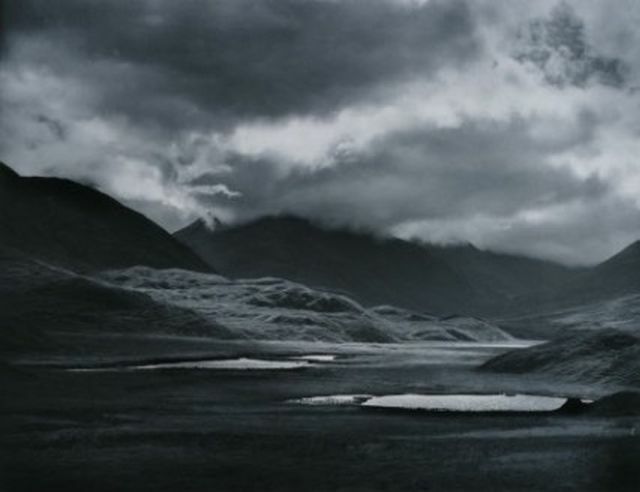 The black and white photographs from this decade have a sharper focus, stronger contrast that emphasises the drama of mountain landscapes such as ‘Suilven, Sutherland’ (above) or the elegant description of trees and clouds in ‘The Copse’. Close to home – and taken much later, in 1965, is ‘An Old Lancashire Lane’, taken in Parbold, near Ormskirk. The focus of the composition is the bend in the country lane bordered by stone walls, which draws the eye towards the farm building beyond. The composition is reinforced by the strong parallel lines of the ploughed field on the right, edged by the curving line of tractor tracks. Other photos in this excellent exhibition are: ‘Late Afternoon in Borrowdale’ (1936), ‘A Dusting of Snow, Kerry Hill’ (1955), Near Northrop, August’ (1950), and ‘The Roman Wall’ (1937). 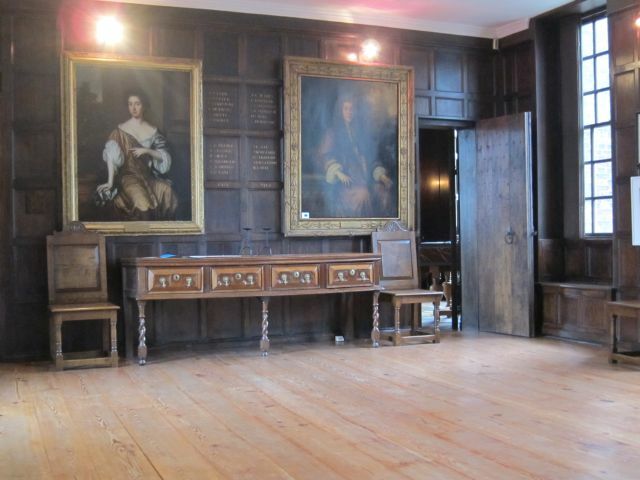 The exhibition will move to the Hardman House on Rodney Street after the Open Eye run ends next month. 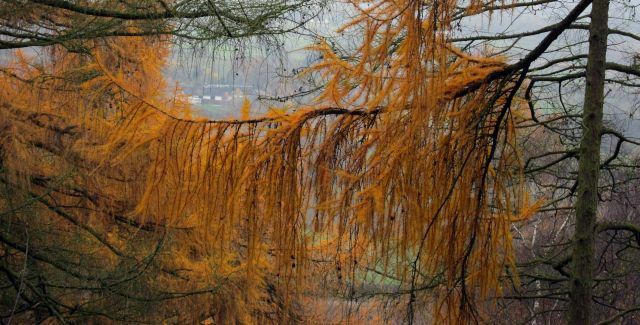 We had joined the Sandstone Trail walking up from the village of Bickerton to the escarpment where we paused to take in the view out across the Cheshire plain, the last of the autumnal colours still lingering. We had got lost briefly in the winding Cheshire lanes, burrowing deep between hedgerows and fields, and I stood and thought about getting lost – really lost – the subject of Rebecca Solnit’s little book A Field Guide to Getting Lost, which I have just started reading. Solnit is the author of Wanderlust: A History of Walking, which I wrote a bit about last month. Lost is small enough to fit in your back pocket, so you could take solace from it, I suppose, if you did get lost – locationally lost, that is: her book is a meditation on getting lost in all senses of the word. 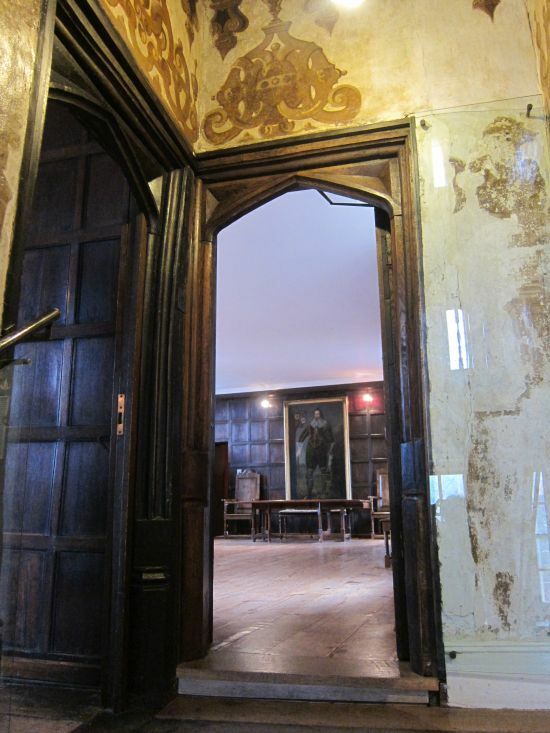 ‘Leave the door open for the unknown’, she writes, ‘the door into the dark. That’s where the most important things come from, where you yourself came from, and where you will go’. The world is blue at its edges and in its depths. This blue is the light that got lost. Light at the blue end of the spectrum does not travel the whole distance from the sun to us. It disperses among the molecules of the air, it scatters in water. Water is colourless, shallow water appears to be the colour of whatever lies underneath it, but deep water is full of this scattered light, the purer the water the deeper the blue. The sky is blue for the same reason, but the blue at the horizon, the blue of land that seems to be dissolving into the sky, is a deeper, dreamier, melancholy blue, the blue at the farthest reaches of the places where you see for miles, the blue of distance. This light that does not touch us, does not travel the whole distance, the light that gets lost, gives us the beauty of the world, so much of which is in the colour blue. Walk the Sandstone Trail and you walk on a ridge of rock formed around 250 million years ago when layer upon layer of Triassic wind-blown sand and river-flood pebble beds were laid down in desert conditions. 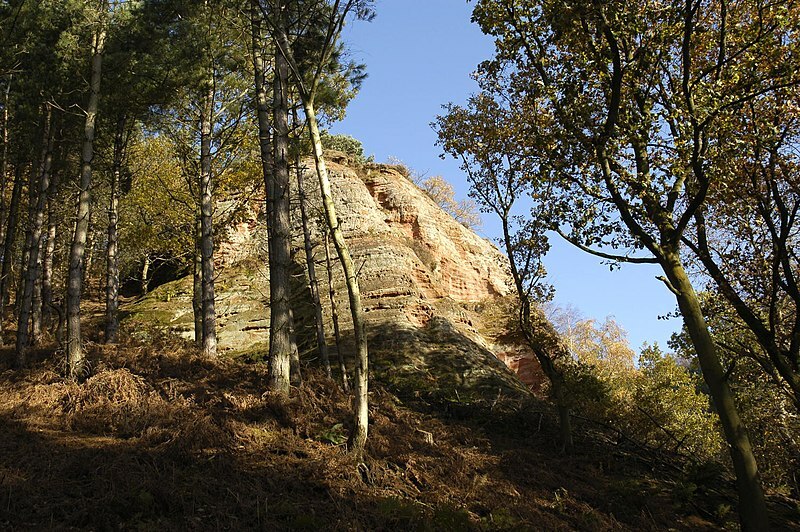 Climb the escarpment from Bickerton and you reach on of the highest and most dramatic points of the trail, chosen by Iron Age villagers as a suitable site for their fortified encampment. Maiden Castle is one of a series of six forts on the Cheshire Sandstone Ridge, hilltop sites probably first enclosed in the Neolithic, around 6,000 years ago, to mark them out as special places. By the late Bronze and early Iron Age these hilltop enclosures had become increasingly defensive, possibly to protect and regulate important goods such as salt, grain and livestock. Maiden Castle may have been occupied during the Roman period. To the west, looking out toward the Welsh mountains, the fort is defended by the natural cliff edge, while two semi-circular ramparts enclose the southern and eastern sides. These once stood two metres high and were made of dry stone walling with a core of earth and timber. The fort had an inturned entrance that strengthened the weakest point of the defences. Excavations at similar sites have shown that these forts were once bustling settlements with timber roundhouses, storage buildings, rubbish pits, trackways and enclosures for animals. 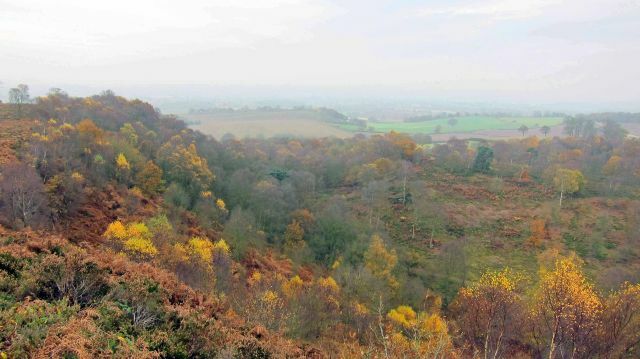 Bickerton Hill is one of few remaining areas of heathland in Cheshire, a seemingly timeless landscape where views from the hillfort across the heather and bilberry patches towards the distant hills have changed little through the millenia. Yet this is not actually so: the heath has seen a variety of land uses over the last century which allowed birch, pine and oak to grow and shade out the bilberry and heather that had flourished for centuries as a result of grazing which ended in the 1930s. 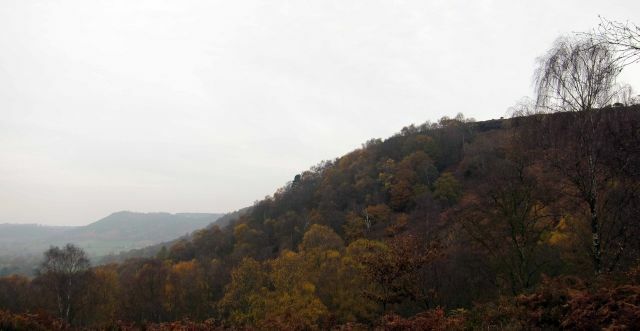 For a decade now, though, under the care of the National Trust, work has been ongoing to remove the encroaching trees and restore areas of the hill to heathland. Grazing has been reintroduced to recreate and maintain a mosaic of heath and woodland. These steps are being taken to halt the spread of birch trees (still the predominant feature along the trail) for, lovely as they as they are, they threaten the future of the rare heathland habitat on the hill. 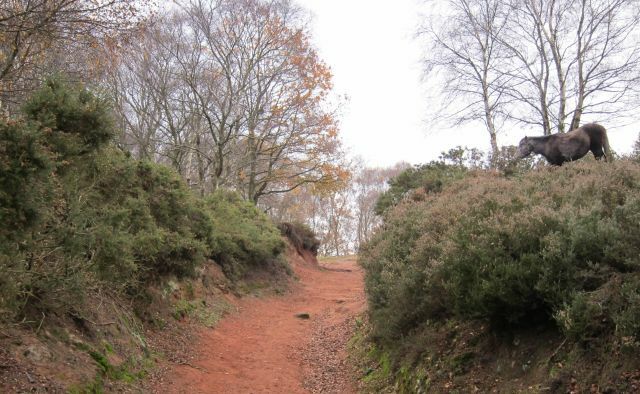 Bickerton Hill is a Site of Special Scientific Interest and provides a home for many rare or threatened animals and plants, including lizards, adders and birds of prey. 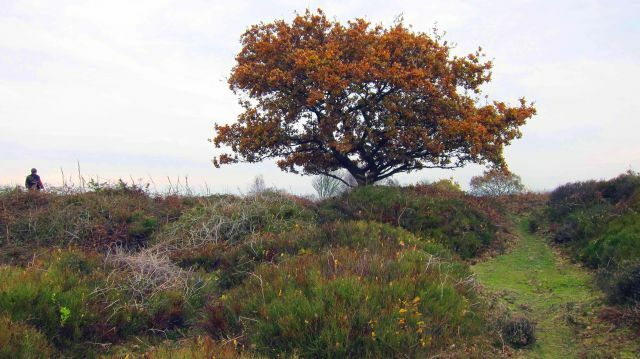 The heath is considered to be the best of its kind in the county. 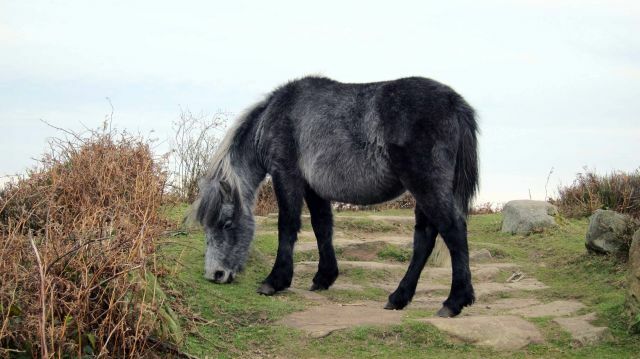 Working with the Habitats and Hillforts Landscape Partnership Project, the National Trust have introduced a herd of rare Welsh mountain ponies onto Bickerton Hill to help restore the lowland heath habitat that across the British Isles is disappearing faster than the rainforests. Nearly half of this type of habitat has vanished in the last 50 years. 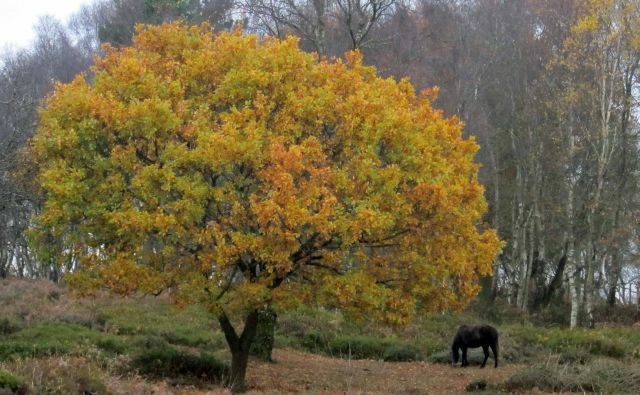 When grazing ended in the 1930s, pine, oak and particularly birch saplings were able to flourish, and the Trust wages a constant battle to keep the saplings at bay – which is where the Welsh ponies that we encountered in several places, munching on the vegetation – come in. We had left Liverpool in sunshine, but soon after reaching the ridge the cloud cover began to thicken, threatening the rain that was forecast. 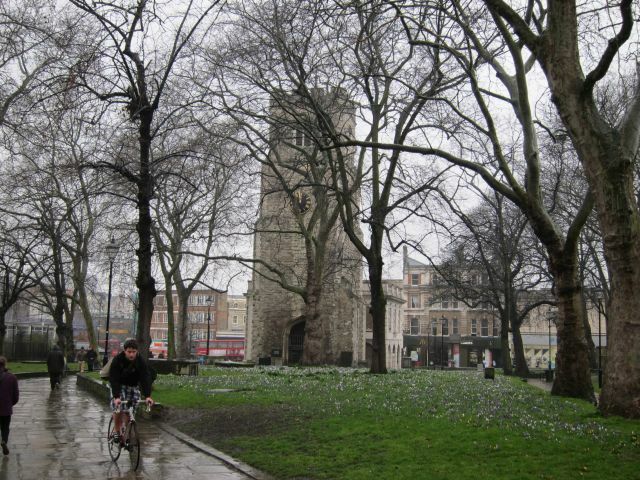 But the day remained dry, though increasingly murky. Indeed, underfoot this was the dryest walk we’ve done for quite some time. We walked the ridge as far as Larkton Hill and Hether Wood, returning on one of the many alternative paths to the Sandstone Trail. 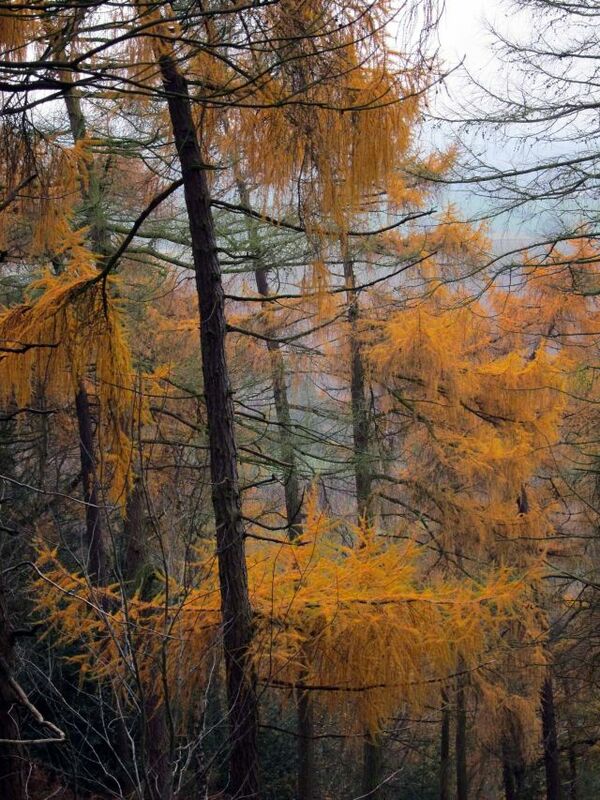 On the lower slopes the silver birches predominated, but with occasional stands of larches, their delicately drooping needles turned autumnal gold. 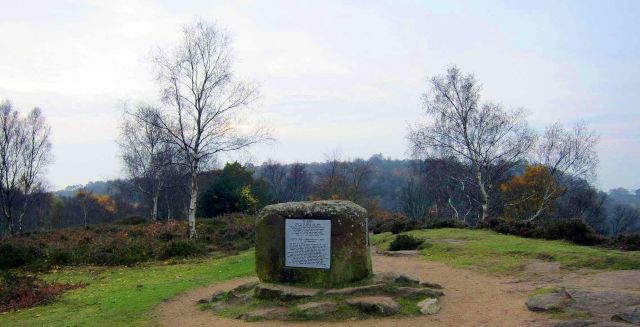 At the highest point of the hill a huge block of sandstone has been turned into a memorial dedicated to the wife of the benefactor who helped the National Trust acquire the hilltop heathland. 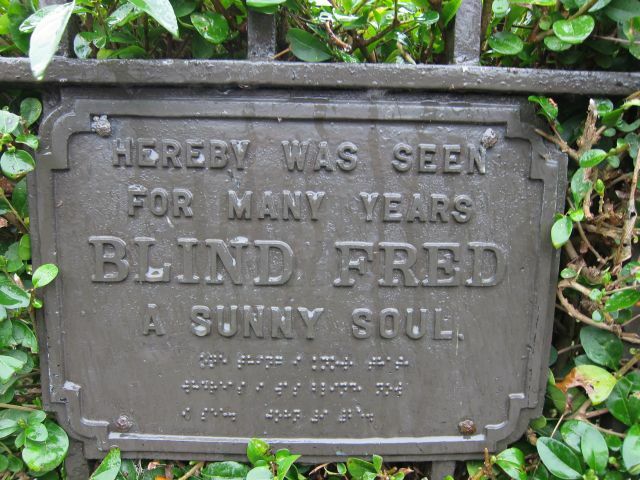 Known locally as the Kitty Stone, the memorial displays poems written by Leslie Wheeldon in memory of his wife Kitty. As we came down off the ridge smoke from a bonfire curled up from the valley. A few trees still bore their autumnal colour, though most by now were stripped bare. A holly bush was dense with red berries – sign of a hard winter to come? I have walked myself into my best thoughts and I know of no thought so burdensome that one cannot walk away from it.… if one keeps on walking everything will be all right. The dog thought so, too. Back at the car, it was time to restore the body with lunch at the nearby Cheshire Workshops cafe: a bowl of home-made leek and potato soup did the trick. There’s a place I like to go sometimes with the dog, an open space of wildness and natural beauty that comes unexpected in the suburbs of a large city. Childwall Woods and Fields is a Local Nature Reserve, and I was out there the other day enjoying the current spell of warm, fine weather. In high summer there are expanses of swaying grasses, shading from golden to purple, dense clumps of blackberries and the brilliant red splashes of mountain ash berries. I like this place because it is not kempt – although some agency keeps the main paths mown, there are dense, impenetrable swathes of nettles and brambles, visited only by butterflies and bands of gossiping finches swooping to grab seeds. 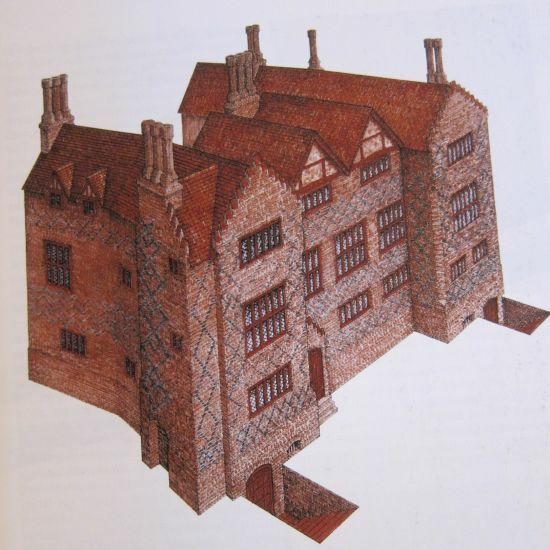 But yesterday, on the Today programme, I heard Dame Fiona Reynolds, the National Trust director general, talking about the government’s proposals to simplify and relax the planning application procedures in order to encourage economic development. 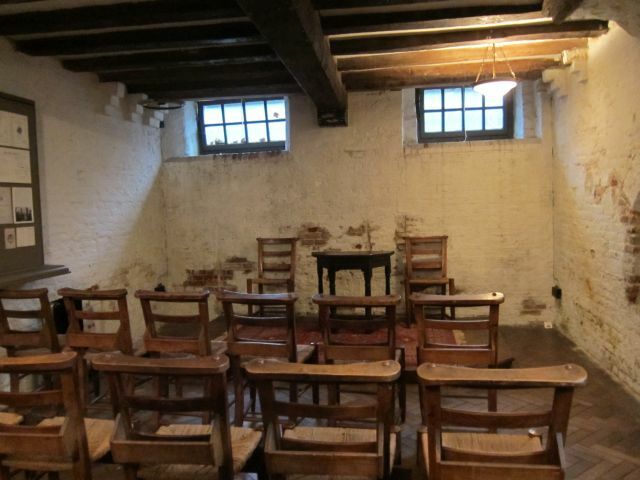 Alarm bells rang – is this lovely open space safe from profiteers? 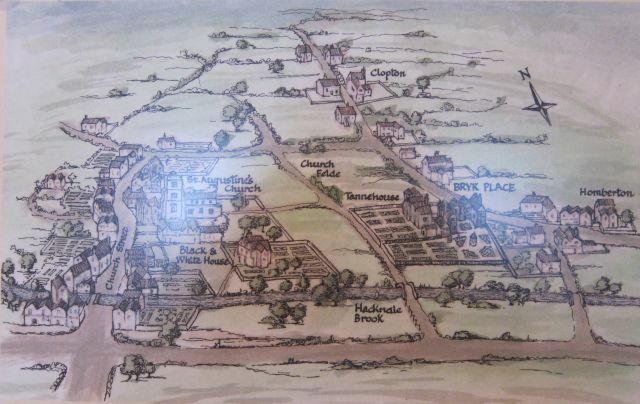 Fiona Reynolds said, ‘What people think of when they think of places they love is very often the bit of green space, the local countryside, which often is not designated, but which has been protected by the planning system’. 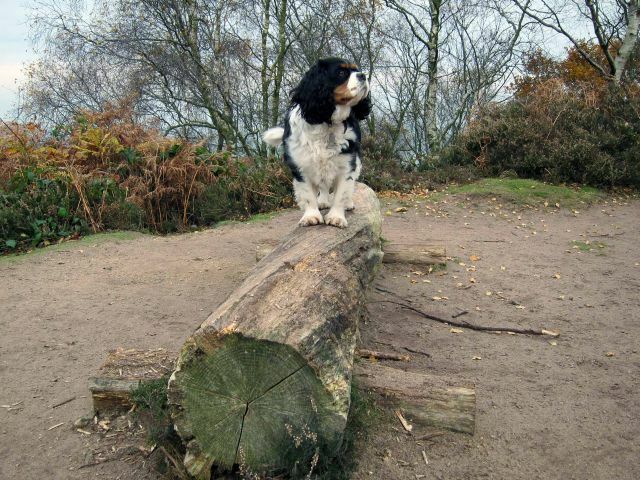 She gave as examples of designated areas green belt, areas of outstanding national beauty, and so on. She didn’t mention Local Nature Reserves. 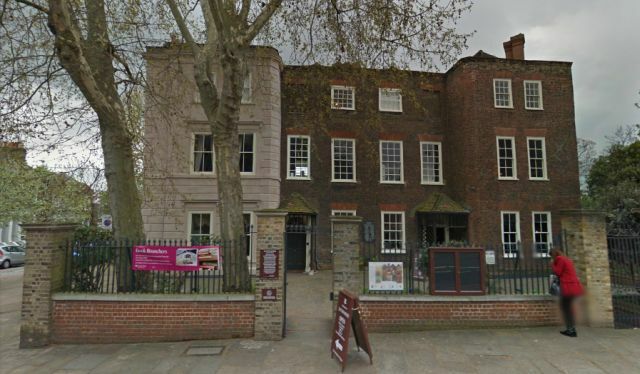 The National Trust is warning that the government proposals to change planning laws in England will favour business too much, and could lead to unchecked and damaging development. The new rules will let the public and conservation down by undermining the planning system’s ability to protect nature outside internationally-recognised wildlife sites. Most controversial is the presumption in favour of ‘sustainable development’ – a major change in emphasis from the current system which sees planning officers weighing up a range of concerns before making a decision. Instead, the default assumption will be that development proposals will be approved. The planning system is what protects the England we all hold dear – our iconic landscapes and our wildlife-rich habitats. It is there to represent the interests of the public in the face of complex decisions, and it will fail us all if one factor – economic growth – is set higher than any other. So, is a Local Nature Reserve (LNR) like Childwall Woods and Fields (shown on map, above) designated? I don’t know. All I can discover is that a LNR is a statutory designation made under Section 21 of the National Parks and Access to the Countryside Act 1949, and amended by Schedule 11 of the Natural Environment and Rural Communities Act 2006, by principal local authorities. According to the Natural England website, there are now more than 1400 LNRs in England. They range from windswept coastal headlands, ancient woodlands and flower-rich meadows to former inner city railways, abandoned landfill sites and industrial areas now re-colonised by wildlife. In total they cover about 35,000 ha. This is an impressive natural resource which makes an important contribution to England’s biodiversity. Because Local Nature Reserve is a statutory designation, it is a very clear signal to a local community of the local authority’s commitment to nature conservation. An LNR can be given protection against damaging operations. It also has protection against development on and around it. This protection is usually given via the Local Plan, (produced by the planning authority), and often supplemented by local by-laws. Unlike national designations, the level and type of protection afforded an LNR is decided locally, and varies from site to site. 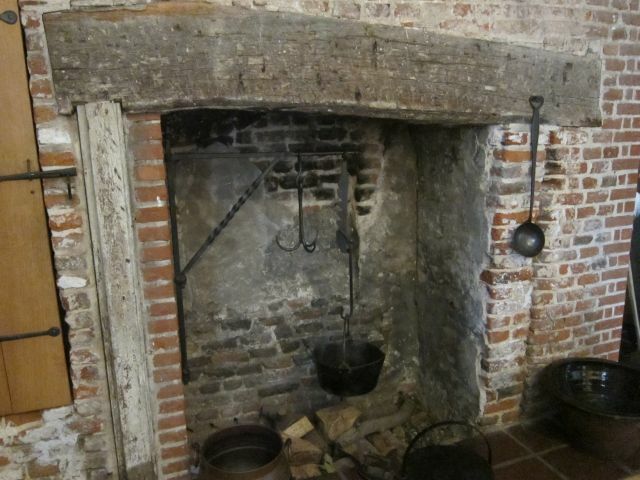 The history of this place is interesting. 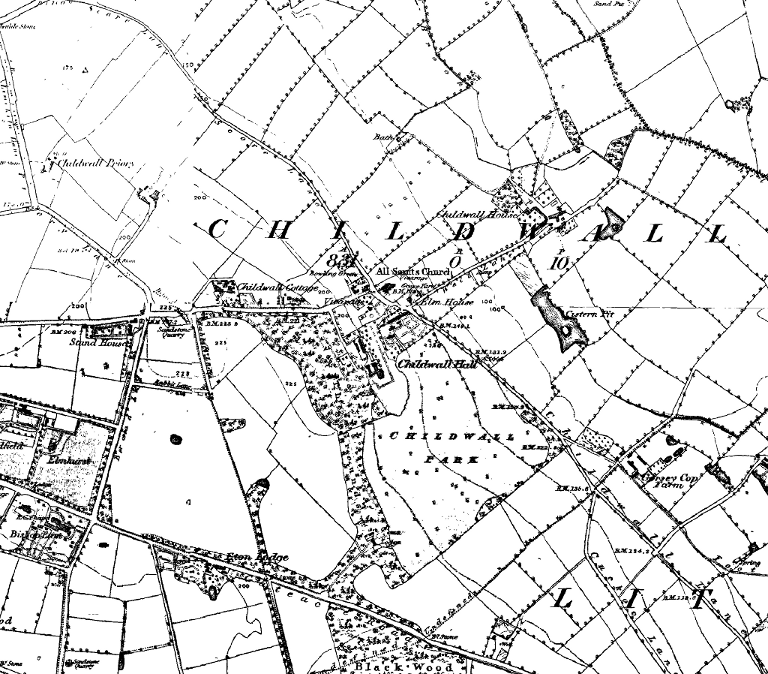 The area we know as the Fields today has virtually the same boundaries as it did a century and a half ago, as can be seen from the first Ordnance Survey map of 184 (below). But during that time the land use has changed. Originally the land sloped gently from what is now the Woods down to Childwall Lane. The area was open, with only a sparse covering of trees and the only one building (on the land opposite the Childwall Cross on Childwall Lane). Through the 1960s and early 1970s, the area was used as a landfill site and the land was re-shaped into three ascending levels, then left to re-green as grasses, bushes and trees gradually established themselves. 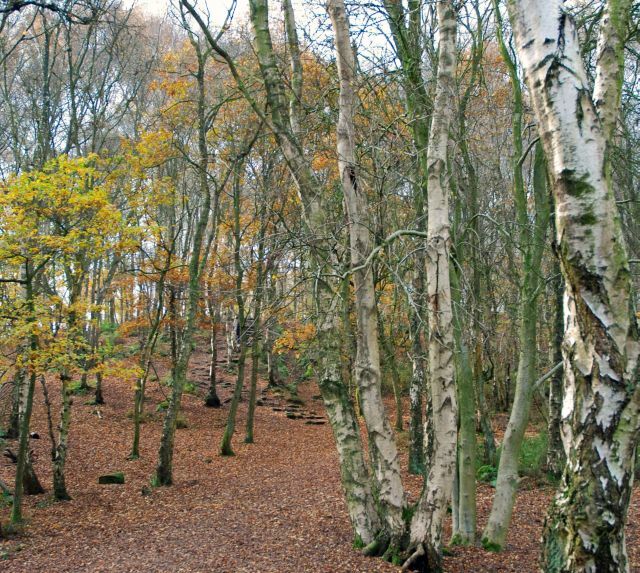 Now the area of the Fields and the adjoining Woods has been named a Local Nature Reserve,with sixteen species of trees in the Woods, and further planting of native deciduous trees in the Fields as part of the Mersey Forest project. 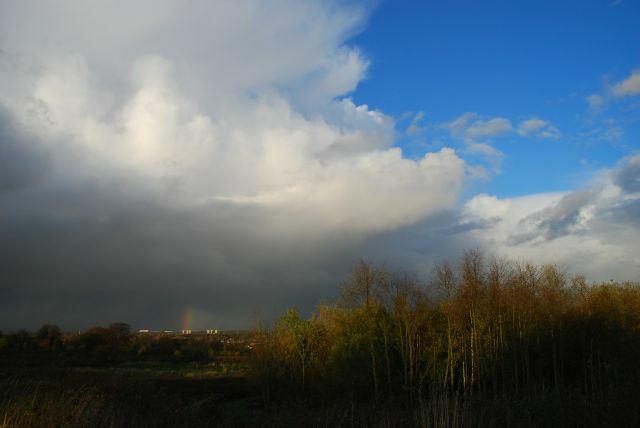 The site is valued because of its wide range of urban wildlife, now supporting a wide range of species, including at least 60 kinds of birds, including Kestrels and Sparrowhawks that regularly nest in the woods along with Great and Lesser Spotted Woodpeckers. Sixteen species of butterfly have been recorded on the Fields, including Small Blue, Small Copper and Red Admiral. The grasslands are home to Bluebells and Common Spotted and Southern Marsh Orchids in early June. Bats, grey squirrels, voles and foxes are also regularly seen in the area. The view from the Fields on a clear day is superb, looking across the Lancashire and Cheshire plain towards the West Pennines and Pendle Hill to the north east. In the foreground the Widnes Runcorn Bridge crosses the River Mersey at the narrowest point in the inner estuary. We need places like this. They should be protected from the developers and profiteers. Update: excellent article by Simon Jenkins – This localism bill will sacrifice our countryside to market forces – in The Guardian 28 July. I often wonder, when exploring extensive gardens stretching across acres and created at the whim of some wealthy landowner in a previous century, what it must be like to exert such control and impress your will over such expanses of nature. Kipling’s poem reminds us of the many unsung ‘men and ‘prentice boys’, largely hidden from history, who laboured to bring a rich man’s vision to life. The garden at Bodnant, which four of us explored today on a jaunt to Anglesey, is truly one of the most beautiful gardens in the UK. The garden faces across the Conwy valley towards the Snowdonia range. The view from the terraces (above), looking across to the Snowdonia mountains is, as F remarked, one of the best examples of the imposition of a piece of man-made beauty on existing natural beauty. It’s as if the mountains are part of the garden. On his retirement in the 1870s, Pochin was able to pursue his passion for gardening – firstly on the Great Orme at Llandudno where he created an extensive and steeply terraced garden that since 1929 has been under the care of the local authority and freely open to the public – then at Bodnant, an estate comprising 80 acres and 25 farms, from 1874 onwards until his death in 1895. Bodnant House (above) had been built in 1792 but was remodelled by Pochin and on his death it was inherited by his daughter (whose husband became the first Baron Aberconway in 1911). 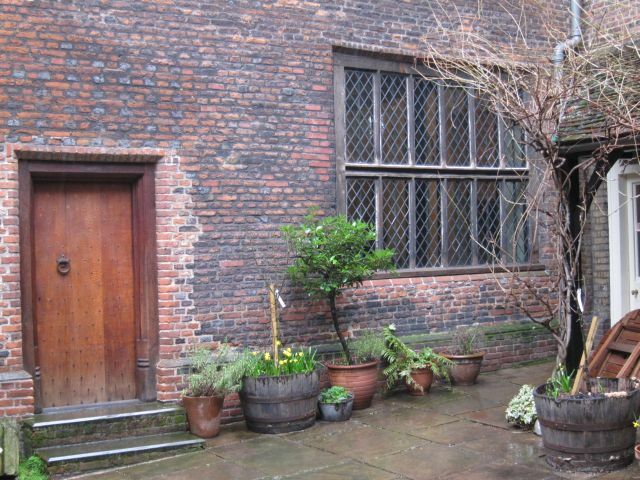 The garden, but not the House or other parts of the estate, was presented to the National Trust, with an endowment, in 1949. The garden has two parts: the upper garden around Bodnant House consists of the terraced gardens and informal lawns shaded by trees. The lower section, known as the Dell (below) is formed by the valley of the River Hiraethlyn and forms a tranquil wild garden with giant conifers, the shade loving herbaceous plants and blue flowering hydrangeas growing along the river bank. The upper garden below the house features huge Italianate terraces, specimen trees and formal lawns, with paths descending to the Dell. In the summer months the terrace gardens are colourful with herbaceous borders, roses, water lilies, clematis and many unusual wall shrubs and climbers. The Pin Mill (below) is an elegant building originally constructed as a garden house around 1730 in Gloucestershire, and later used as a rural factory making dress-making pins. 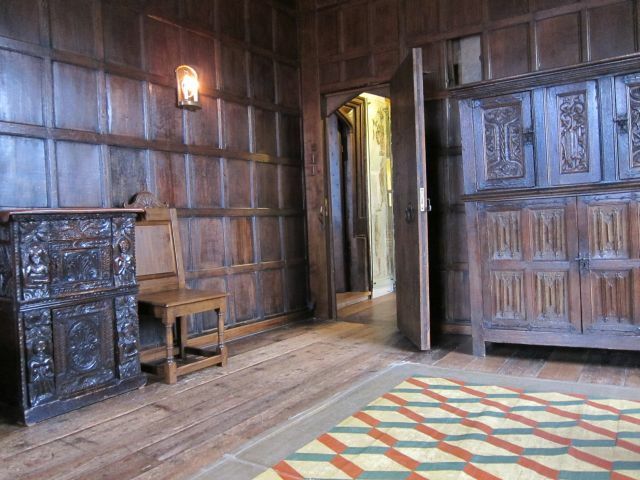 In 1938 it was in a decayed state when Lord Aberconwy bought it and had it moved from Gloucestershire to Bodnant. Bodnant Garden is renowned for growing a wide range of interesting and beautiful plants from all over the world, particularly China, North America, Europe and Japan, that are suited to the Welsh climate and soil. 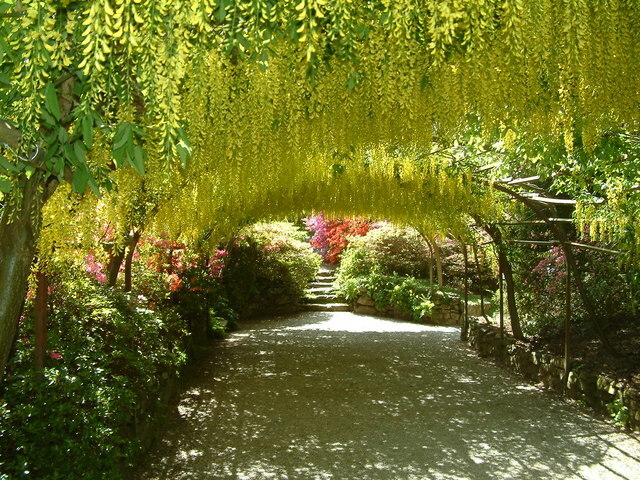 One of the highlights is the Laburnum Arch, a curved walk covered with laburnum which produces a magnificent cascade of long yellow flowers in late May and early June. We’ll have to back to see this wonder, revealed in the stock photo below.